Forget New York. Forget Los Angeles. 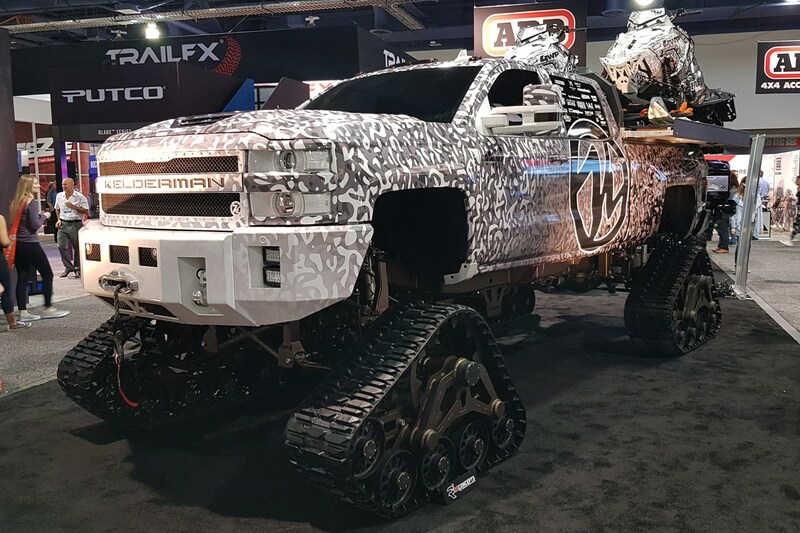 The SEMA show hosted every year in Las Vegas is quite possibly the craziest car show in the United States. 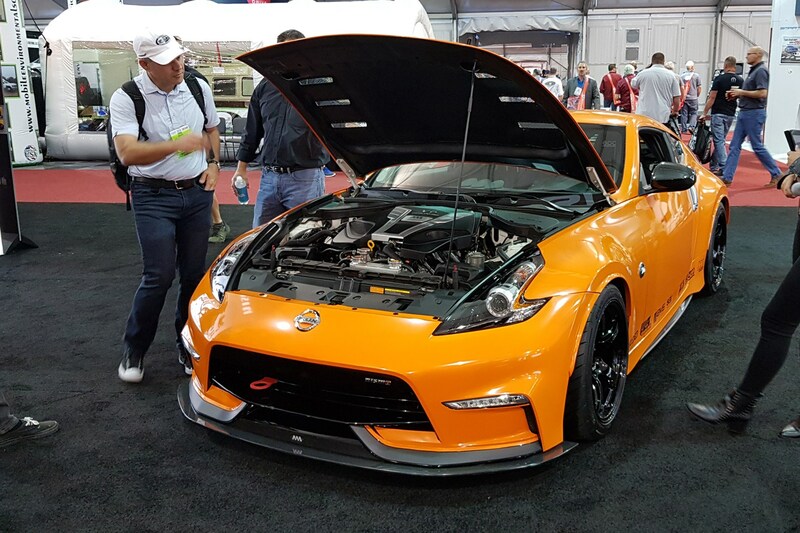 CAR has been on the floor at the 2018 SEMA show to soak up the modified cars, new models and extreme expressions of the motoring world all in one air-conditioned, jazzy carpeted convention hall. 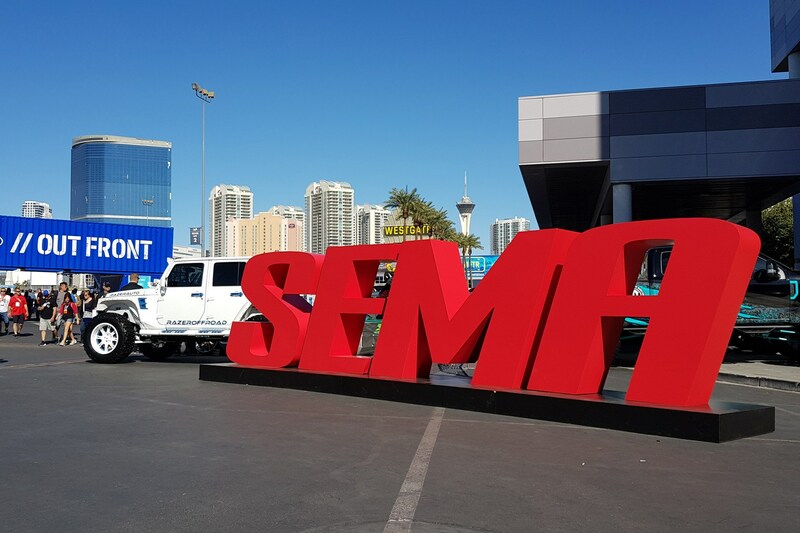 In case you don’t know what SEMA is, it’s the Speciality Equipment Market Association show that specialises on all of the aftermarket parts suppliers coming together in one place to show off their latest equipment. Plenty of car makers get in on the act too, either demonstrating what their in-house accessories departments can do, or just taking advantage of such a concentrated motoring fan base to show off something new. It may rake in fewer guests than CES but still manages to get around 160,000 people that include exhibitors, media reps like us and buyers looking to find new wares for their shops. 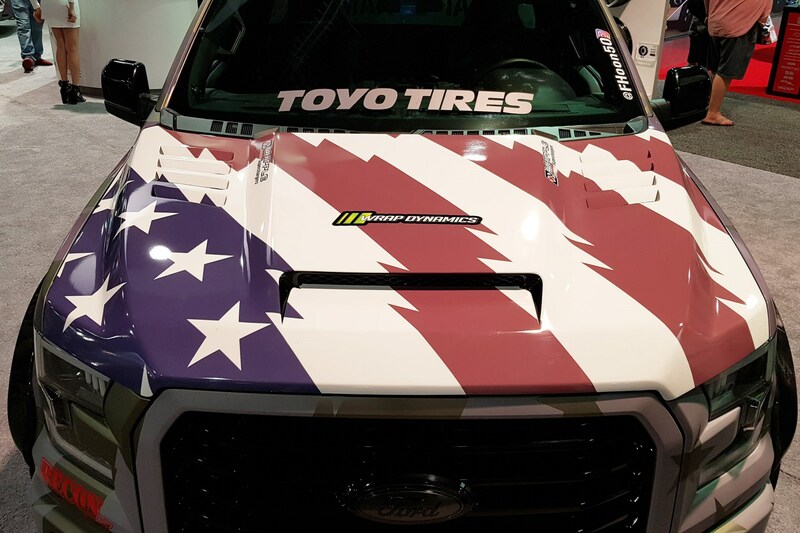 Keep scrolling for our best pictures from the 2018 SEMA show. Because it’s Nacho Jeep! 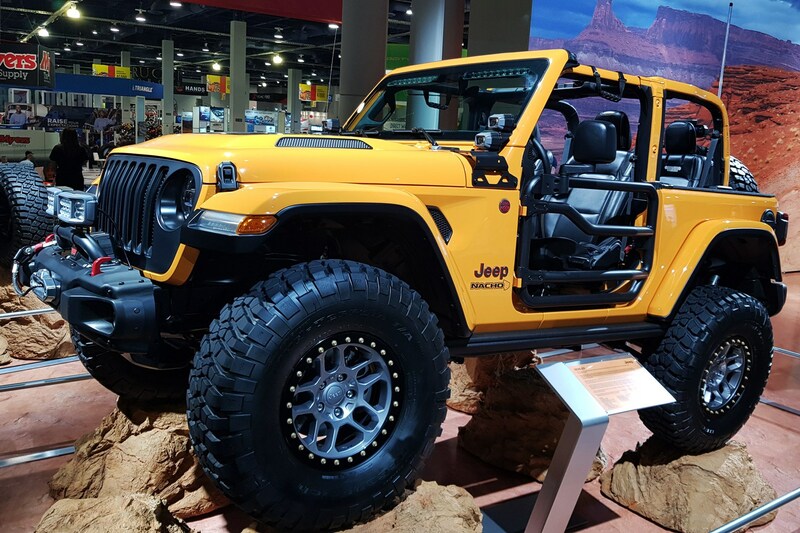 This is one of Jeep’s Easter Safari concepts, packed to the gills with Mopar parts and finished in the colour of that gloopy cheese you always get with it. Check out those barred doors! Well, it is the States, remember. The US flag could be seen everywhere, with many of the modified cars promoting the fact that they were built or modified in the USA. ‘Murica. 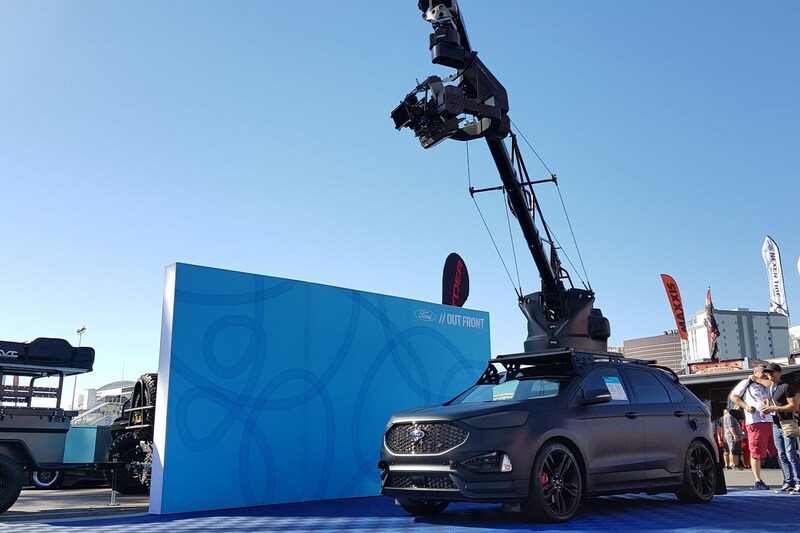 This is Ford’s new tracking car – a matte black Edge ST with a gigantic crane with a camera attached. The brand is in discussions for the car to be used in future feature films in order to get those smooth, high-speed driving shots. Toyota also had a Corolla on its stand with similar modifications. Would you like some truck with your engine? 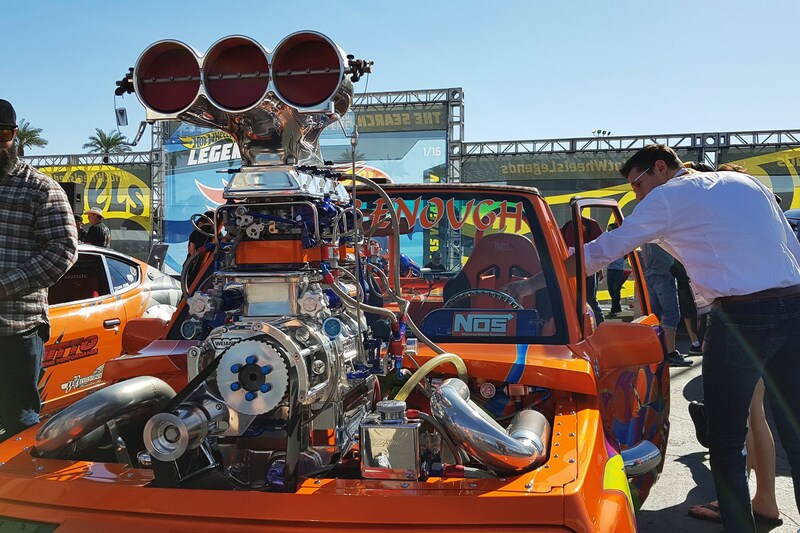 This Chevy pickup had quite possibly the tallest engine block on show. Number conveniently read ‘NVR ENOUGH’. Yeah, no kidding. It seems caterpillar tracks are the in thing, and this is quite possibly the most OTT car wearing the all-terrain perambulators. Some swears were said when we first laid eyes on this. 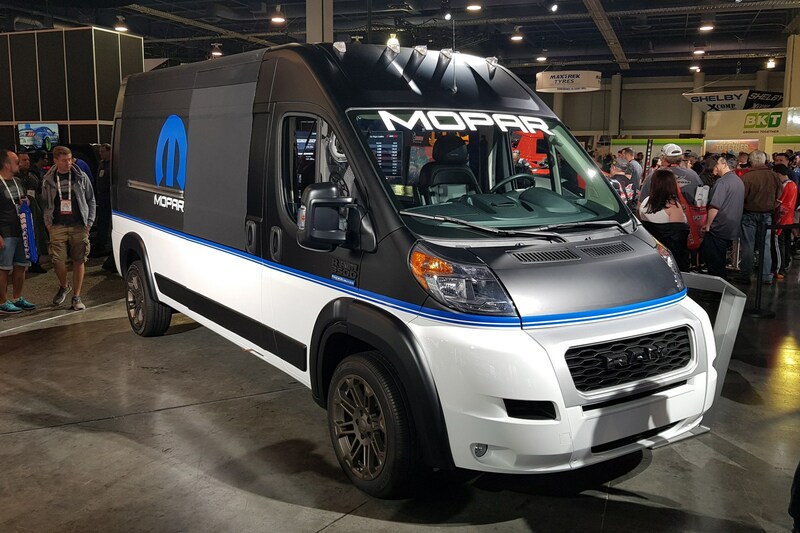 Mopar has thrown the whole parts bin at this Ram 3500 van – also known as a Fiat Ducato back in Europe. 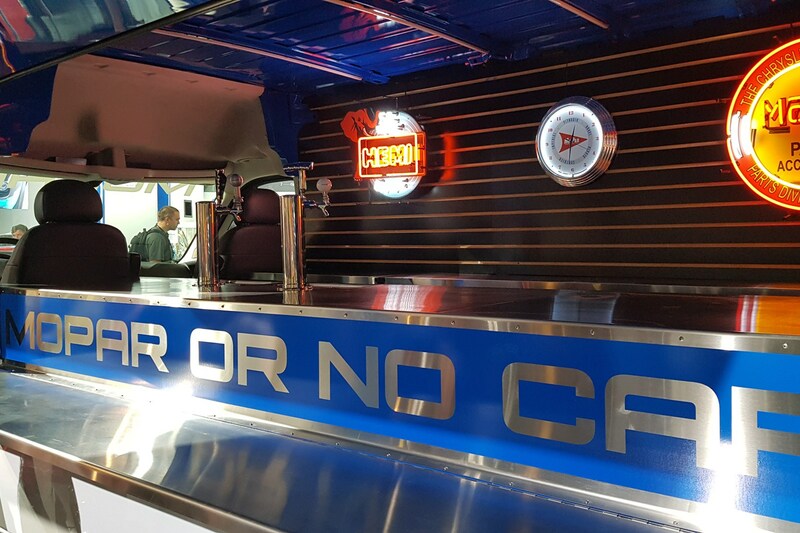 Said Ram 3500 just so happens to be kitted out with a whole bar that served attendees a free beer after the Mopar press conference. More of which we’ll get on to later. 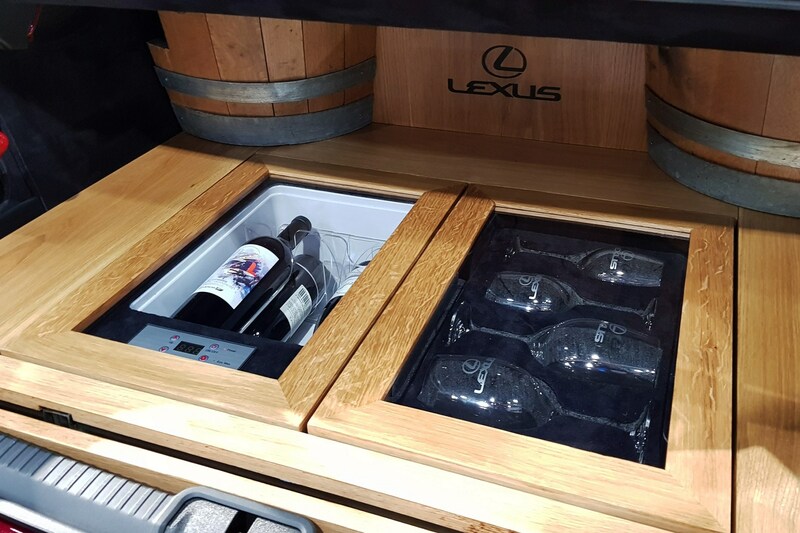 While Mopar’s stand had an active bar for a short time in the afternoon, Lexus had a claret red ES350 saloon with its own wine cellar inside. It holds four wine glasses and up to seven bottles of wine. 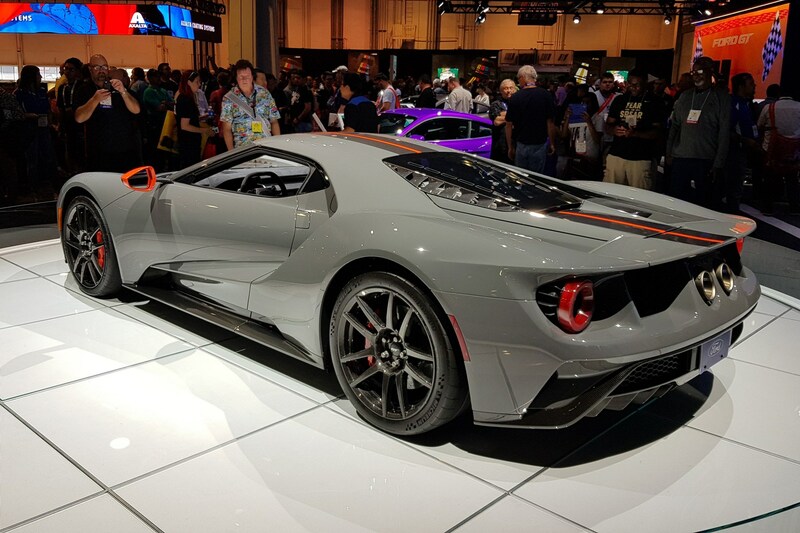 After recently confirming that the production run will be extended into 2022, Ford has raided the carbonfibre cupboards for the new Carbon Series. Ford has ditched a couple of interior luxuries (the infotainment and air-con still remain), has an Akrapovic exhaust and will represent one of seven new GT cars being built from now on. 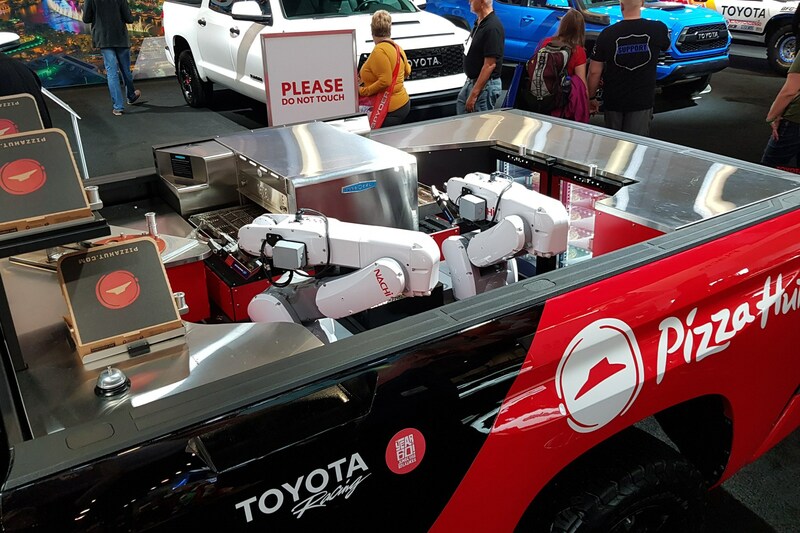 Over at Toyota, the Tundra PIE Pro pick-up had pizza-making robots in the load bay. They don’t make them entirely from scratch, though, instead pulling out pre-made refridgerated ones, cooking them, cutting them and boxing them. Still want one. 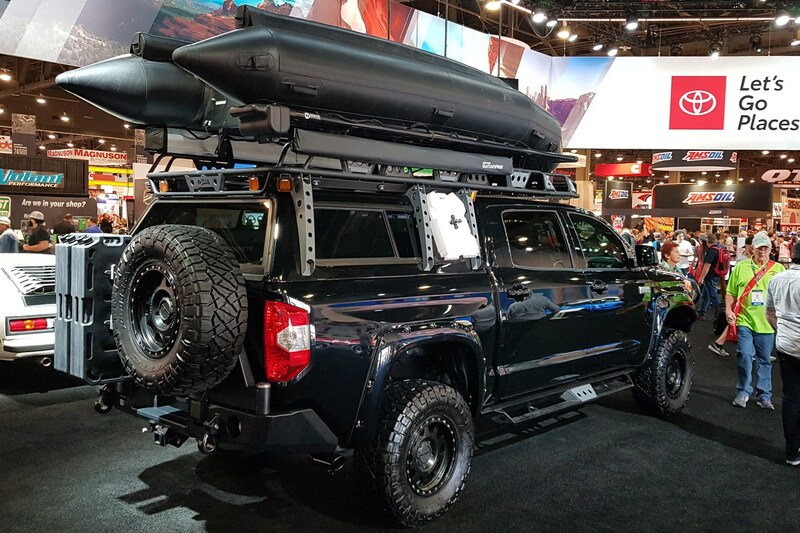 This Toyota Tundra is the wilderness toy of Kevin Costner, with Toyota’s US custom team befitting it with 4.5-in lift kit, Fox coilover suspension and a two-piece roof rack. Perfect for mounting a giant dinghy to it. So long as it’s as retina-searing as possible. 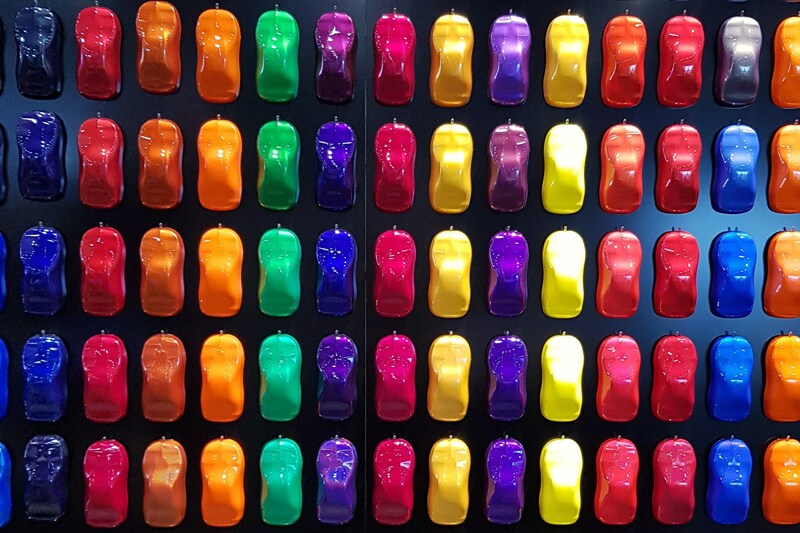 A set of paint colour demos show the wild spectrum of finishes for your customised ride. It’s difficult to choose which one doesn’t make us inadvertently blind others. See those nostrils? 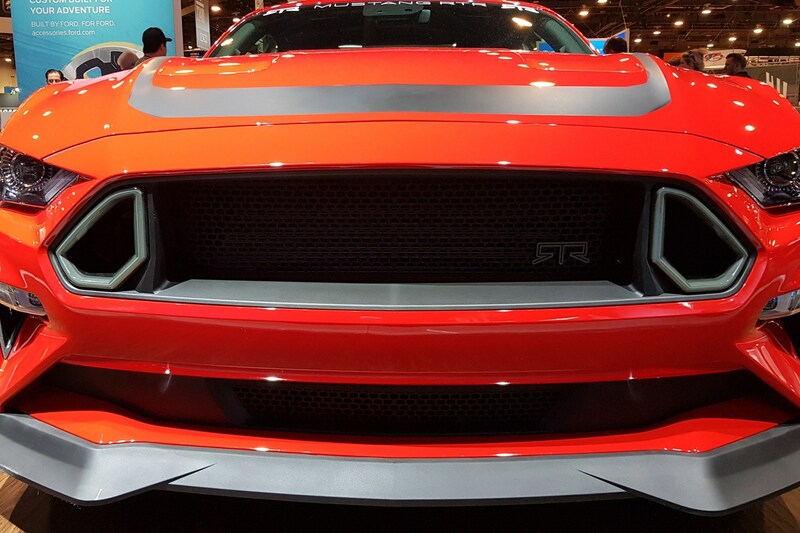 They light up on this RTR Vehicles Mustang, which is not only super cool but mimics drifting champ Vaughn Gittin Jr’s 900bhp drift-spec Mustang. The ‘Series 1’ of performance parts can be bought in US Ford dealers from 2019. 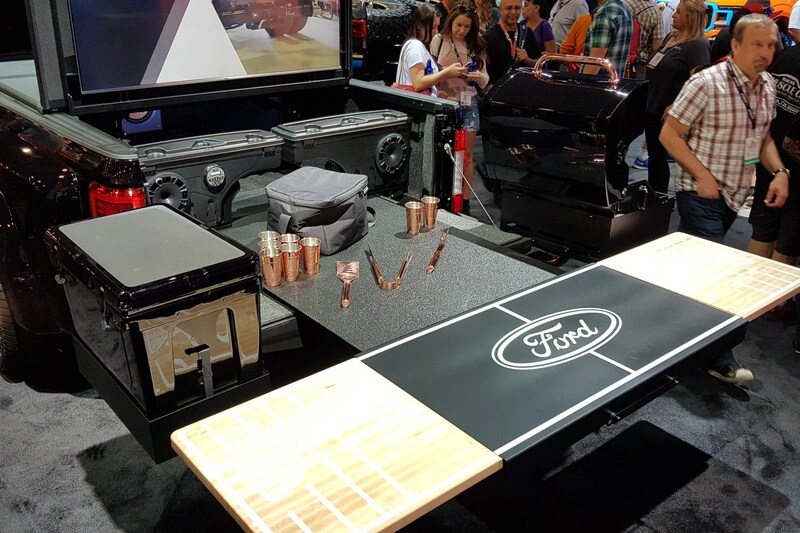 Staying with Ford, the brand had a huge line-up of F-Series and Ranger pickup concepts, including this one that’s built to be the ultimate tailgate party companion. There’s a BBQ, OLED TV and banging sound system for your rural parties. Wrong. 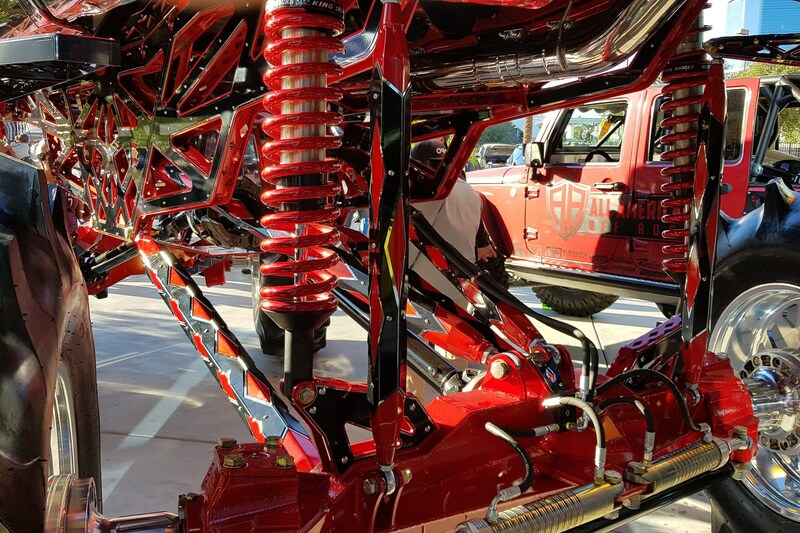 This has to be one of the tallest trucks at SEMA, and this is just its meticulously shiny undercarriage. There’s about 6 feet of frame here before you get anywhere near the rest of the truck. So much so that the tow bar is pretty much a ladder to get into the load bay. 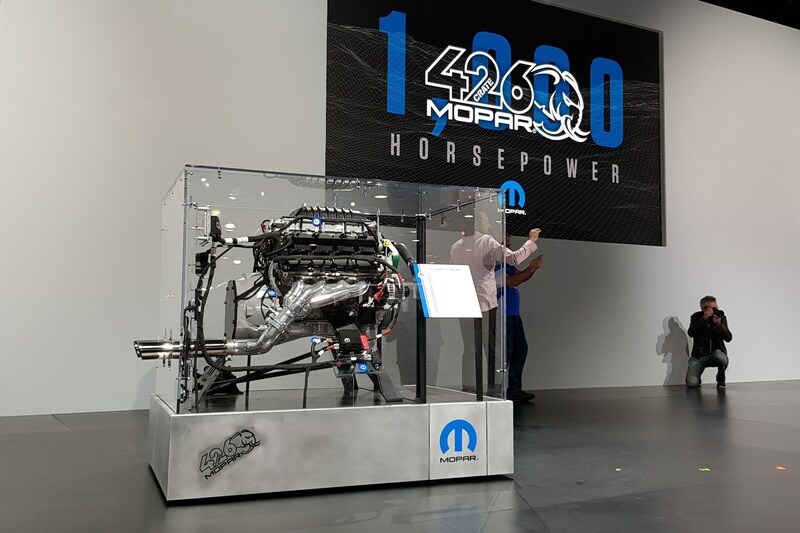 Forget the Hellcat engine – Mopar revealed a new HEMI V8 with 1,000 horsepower and 950lb-ft. They call it the Hellephant, which might be up there as one of the coolest names to give anything ever (along with Hellcat). It also sounds absolutely epic. 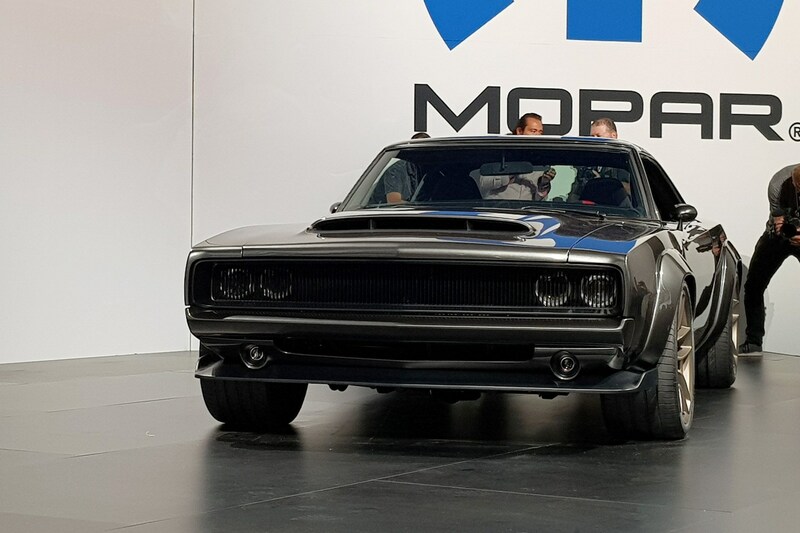 Not only did the new Hellephant engine make wave among SEMA fans but Mopar went one step further, inserting it into this absolutely gorgeous “Super Charger” concept car – a modified Dodge Charger. No, not really. Nissan is wringing every last bit of life out of the 370Z with this: the Clubsport 23. Out goes the 3.7-litre naturally-aspirated V6, replaced with a 3.0-litre twin-turbo V6 making 400 horsepower from the Infiniti Red Sport models.